The image MUST be looked at with a 24-bit colour display - any less and the image looks poor. It is OK on a 16-bit display, but dreadful on an 8-bit (256 colour) display. 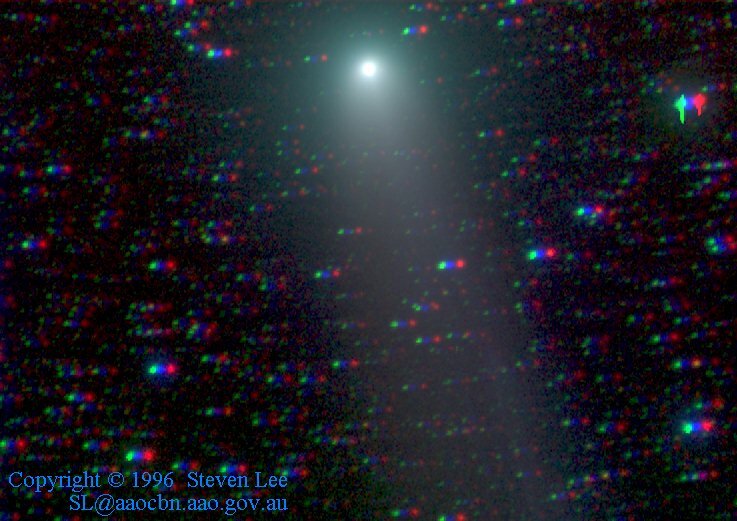 The images were take on 1995 March 15 UT with a CB245 CCD camera and a 171mm focal length lens at f/1.9. The filters were photometric BVR. The 4 R (red) frames were each 30 seconds between 14:39 and 14:41 UT The 7 B (blue) frames were each 120 seconds between 14:59 and 15:12 UT The 4 V (green) frames were each 60 seconds between 15:20 and 15:24 UT The image scale is approximately 10 arcseconds per pixel, and the image is oriented approximately North right, East up.